The Aho-BIS partnership continues to blossom; from its early flowering with the First Symphony in 1989 it’s proved remarkably hardy, yielding a number of symphonies - 15 at the last count - concertos, vocal and chamber works. I’ve reviewed all the recordings for MusicWeb, the bulk of them in my Aho survey of September 2008; the most recent release - the three Chamber Symphonies - was reviewed for Brian Wilson’s Download Roundup. Happily it doesn’t end there, for BIS supremo Robert von Bahr has promised us part one of Aho’s complete organ music (BIS-SACD-1946) and an Oboe Concerto. What’s most intriguing about this review disc is that it features Osmo Vänskä not as a conductor but as a soloist. He was a guiding light in this Aho series until he decamped to Minnesota in 2003, but now he’s found space in his busy schedule to show off his skills as a clarinettist in this quintet and trio. Aho’s certainly familiar with the former, having written a number of pieces for five players, and from the start of this clarinet-led newcomer it’s clear he hasn’t lost his talent to surprise. Speaking of the unexpected, Vänskä the soloist - now eloquent, now earthy - is a real delight. 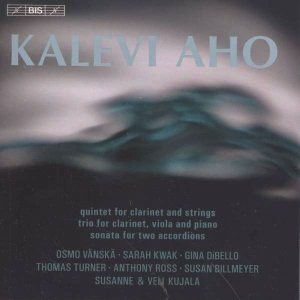 The first movement of the quintet encapsulates much of what makes Aho’s music so very listenable. True, the piece has its sinewy side, but there’s an underlying lyricism and narrative strength that can’t fail to impress. All his players are given a chance to shine: extremes of register tempered with moments of striking inwardness. That said, the piece wears its virtuosity lightly; the second movement is especially challenging in its range and degrees of animation and the third is dominated by some of the most wistful - and seamless - clarinet sounds I’ve heard in ages. Not to be outdone, the other members of the group play with considerable trenchancy when required; they’re also very much at ease in the more withdrawn passages that dot this composer’s œuvre. Their playing is captured in sound of clarity and closeness. Some may find the balance a little too forward, but the upside is that every detail of this score is laid bare in a way that’s not at all fatiguing. Indeed, the vigorously motile fourth movement, with its slashing, Herrmannesque strings, is all the more gripping for being so forceful. In the fifth there’s music of rare beauty and equivocation - a trembling, evanescent air - that’s something of an Aho trademark. A fine, artfully structured piece - it never overreaches or overruns - the quintet gives way to an even more economical and alluring trio. Cast in a single movement it’s dense and angular, yet still remarkably lyrical. This apparent sleight of hand is another of the composer’s specialities. The hard outer carapace conceals a melodious and - at times - magisterial core. Susan Billmeyer’s piano is very well recorded, adding warmth and dramatic ballast to the proceedings; Thomas Turner’s viola sound is equally well caught. The accordion sonata, recorded in Finland, sounds rather less forensic than the other two pieces; indeed, the distinctive squeezebox timbres emerge with pleasing tactility and strength, from the bass drone and burble to the instruments’ bright upper reaches. The splashy dissonances certainly caught me on the hop, but as always Aho tempers tough formality - the first movement is a prelude and passacaglia - with moments of soft and sudden quietude. That said, the second movement - a prelude and fugue - majors in arresting glissandi, while the complex fugal section is surprisingly light and honeyed in character. This is another varied and stimulating collection that is very well played and recorded. As for the composer’s liner-notes - as lucid as ever - they strike a good balance between the genesis of these pieces and their musical content. Of the three works here the quintet will probably have the broadest appeal. The sonata - with its remarkably subtle control of dynamics and articulation - is more approachable after several hearings. Fine writing and solid musicianship; a feast for Aho fans.